Travelling in Antigua and Barbuda does not have to break the bank. Cheap hotels in Antigua, as well as cheap villas, hostels, guest rooms and cottages are available, you just have to know where to find them. We have collated information on budget hotels, villas and apartments in Antigua for US$100 per night and under, based on 2 people sharing, for the summer rate for the property. Please note that every property has slightly different dates used for summer and winter, which they will advise you of at the time of booking – however on average the Summer (or Low ) Season is Mid May to end November, and Winter (or High Season) is the rest of the year. are an ideal rental opportunity for people with the fantastic amenities of Jolly Harbour nearby. The apartments are large & airy & the property has beautiful views over the first green of the golf course to the rear, and to the marina from the front. provide fantastic accommodations paired with incredible amenities and services offered by many resorts. is a collection of exclusive, privately owned condominiums surrounded by beautiful tropical gardens with a swimming pool, situated next to Sandals at Dickenson Bay, one of the best beaches in Antigua. offer the convenience of modern living (Wireless Internet) in the relaxed setting of a Caribbean garden with a wonderful pool with spectacular views of Falmouth Harbour. is a capacious, serene and well arranged 2 bedroom villa rental in Jolly Harbour. There are a wide range of amenities including the Jolly Harbour Sports Club, Jolly Harbour Golf Club as well as an excellent supermarket and shopping centre. Located on the water - gorgeous view. There are 10 colourful Caribbean Gingerbread Cottages with panoramic views overlooking the north shore. They are surrounded by lush tropical gardens & have all the comforts of home. provides you with an opportunity to enjoy a Home away from Home. Their spacious apartments have panoramic views from their balconies and are fully air conditioned. Sargeant Manor is close to the many amenities of Jolly Harbour, near to white sand beaches & just minutes away from St. John's. is comfortable & affordable accommodation nestled on the hillside with magnificent views across Turner's Bay and beyond to Montserrat. are two beautiful cottages with superb views over Falmouth Harbour across to Shirley Heights. The location is unique being surrounded by mountains with beautiful sea views. The rates are very affordable and ideal for travellers on a budget. offers waterside accommodation in a beautiful garden setting, within easy walking distance of all marinas in English & Falmouth Harbours. is a unique steakhouse, restaurant, and hotel, open for breakfast, lunch, and dinner. Sip an aperitif with your friends in the lounge area, with dinner served on the terrace. The hotel comprises 10 rooms on the 1st and 2nd floors, 6 standard and 4 superior, furnished in a modern and elegant style. 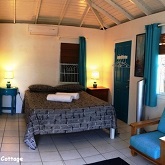 is a great place to stay in Antigua if you are on a budget. It has stunning views of two world class marinas, Falmouth Harbour, and the Antigua Yacht Club Marina & is close to the many bars and restaurants of English Harbour.